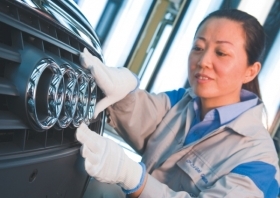 Audi builds long-wheelbase versions of the A4 and A6 sedans as well as the Q5 SUV at its plant in Changchun (shown). Germany's top three premium automakers posted strong sales growth in China in the first quarter, tapping demand for luxury products in the world's largest car market. Audi AG's first-quarter sales in China rose by 77 percent compared with the prior-year period, pushing the automaker above 50,000 sales in a quarter for the first time in China. The Volkswagen AG premium brand delivered 51,449 vehicles in the first three months of the year. “This result means we have further extended our market lead in China's premium segment,” Audi board member for sales and marketing Peter Schwarzenbauer said in a statement. BMW AG's group sales in China more than doubled to 34,179 vehicles in the quarter, it said. Daimler AG said Chinese market sales of its Mercedes-Benz brand rose 105 percent to 24,100 units. Sales of the Audi A4L, a long-wheelbase version of the mid-sized sedan, rose 213 percent to 13,787 units in the quarter. Audi's top-seller in China was the long-wheelbase A6L at 28,984 units, an increase of 35 percent. Those two sedans are build alongside the Q5 premium SUV at Audi's joint venture factory with FAW Group in Changchun. Audi entered the Chinese market in 1988 and finished 2009 at the country's top-selling premium brand with a volume of 158,941 cars. A humming economy and policy incentives helped China post solid auto sales in March, but growth could slow in the second quarter as momentum eases from last year's record-setting pace which saw the country pass the United States as the world's largest auto market.